Insecurity once again prompted me to float the idea for a new comic strip past the syndicate mavens, this time with the artistic help of another artist friend Gerry Shamray. 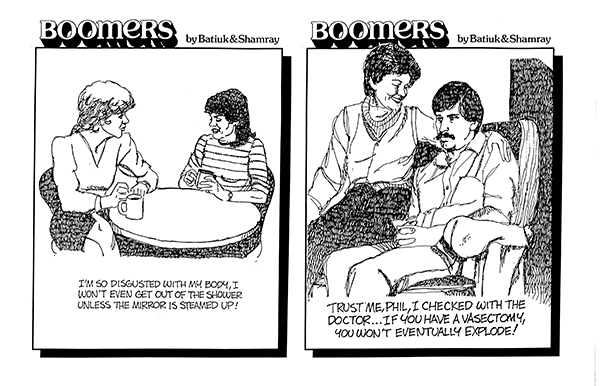 Gerry, who would eventually take over as the artist on John Darling, provided the visuals for a single-panel strip called Boomers. It was a bit of a departure because it was an attempt to write from a more adult perspective with a more sophisticated adult look to the art. We thought that this approach was what was missing from the newspaper comics page, and, when we sent it out to the various newspaper syndicates, they told us they agreed. They also told us that it was going to stay that way. So Boomers, along with Orbit and Rusty, [Read all about ’em in The Complete Funky Winkerbean, Volume 3, 1978–1980.] went into the cartoon drawer of nice tries.